The summer hiatus is over for school kids and your NRZ. Our first meeting of 2016-17 will be Wednesday, September 21, at 6 pm, in the Ground Floor Classroom of the Hartford Public Library, Main Street. We'll have updates on the Hartford Decide$ SoDo Community Garden Project and the basketball courts at Ramon Quiros Park on Hudson Street, the use of Buckingham Square Park, and the MDC sewer project on Whitman Court. 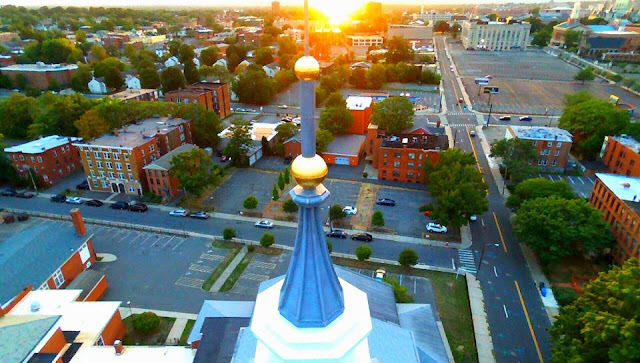 Aerial shot of the southern half of South Downtown, looking west from the steeple of South Congregational Church on Main Street. Photo courtesy of Jeremy Howard.